Norwegians usually spend their long easter holiday in the Mountains in some cabin, and so did I this year. Together with Frederik, Ray and Judith we went skiing in Vrådal. Although the skiing area is not very large, we had a wonderful time and really excellent weather. 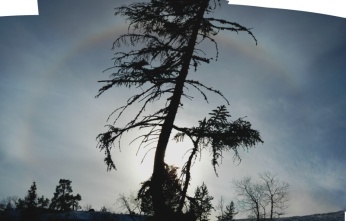 This 22° Halo I first spotted when going up with the elevator to the mountain's summit again - I've been looking for this during the whole trip as I guessed that conditions would be perfect for it. We also had amazingly nice scenery on our way back. The image above is a mozaic of 15 images from a lake near Seljord. The rest of the trip's images are here .